Politician, journalist, and activist for Italian independence/unification. Giuseppe Mazzini (Italian pronunciation: ; 22 June 1805 – 10 March 1872), was an Italian politician, journalist and activist for the unification of Italy. His efforts helped bring about the independent and unified Italy in place of the several separate states, many dominated by foreign powers that existed until the 19th century. He also helped define the modern European movement for popular democracy in a republican state. Mazzini was born in Genoa, then part of the Ligurian Republic, under the rule of the French Empire. His father, Giacomo Mazzini, originally from Chiavari, was a university professor who had adhered to Jacobin ideology; his mother, Maria Drago, was renowned for her beauty and religious (Jansenist) fervour. Since a very early age, Mazzini showed good learning qualities (as well as a precocious interest towards politics and literature), and was admitted to the University at only 14, graduating in law in 1826, initially practicing as a "poor man's lawyer". He also hoped to become a historical novelist or a dramatist, and in the same year he wrote his first essay, Dell'amor patrio di Dante ("On Dante's Patriotic Love"), which was published in 1837. In 1828–29 he collaborated with a Genoese newspaper, L'indicatore genovese, which was however soon closed by the Piedmontese authorities. He then became one of the leading authors of L'Indicatore Livornese, published at Livorno by F.D. Guerrazzi, until this paper was closed down by the authorities, too. In 1827 Mazzini travelled to Tuscany, where he became a member of the Carbonari, a secret association with political purposes. 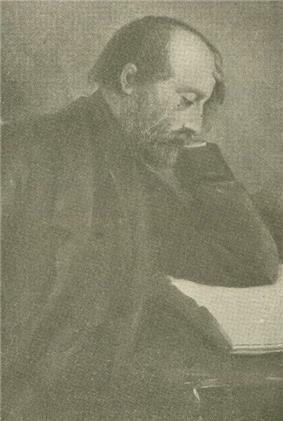 Mazzini, writing under the pseudonym "Piccolo Tigre," was the author the Permanent Instruction of the Alta Vendita, which detailed the overthrow of Catholicism by infiltrating it. On October 31 of that year he was arrested at Genoa and interned at Savona. Although freed in early 1831, he chose exile instead of life confined into the small hamlet which was requested of him by the police, moving to Geneva in Switzerland. In 1831 he went to La giovine Italia (Young Italy). Young Italy was a secret society formed to promote Italian unification. Mazzini believed that a popular uprising would create a unified Italy, and would touch off a European-wide revolutionary movement. The group's motto was God and the People, and its basic principle was the unification of the several states and kingdoms of the peninsula into a single republic as the only true foundation of Italian liberty. The new nation had to be: "One, Independent, Free Republic". The Mazzinian political activism met some success in Tuscany, Abruzzi, Sicily, Piedmont and his native Liguria, especially among several military officers. Young Italy counted ca 60,000 adherents in 1833, with branches in Genoa and other cities. In that year Mazzini launched a first attempt of insurrection, which would spread from Chambéry (then part of the Kingdom of Sardinia), Alessandria, Turin and Genoa. However, the Savoy government discovered the plot before it could begin and many revolutionaries (including Vincenzo Gioberti) were arrested. The repression was ruthless: 12 participants were executed, while Mazzini's best friend and director of the Genoese section of the Giovine Italia, Jacopo Ruffini, killed himself. Mazzini was tried in absence and sentenced to death. Despite this setback (whose victims later created numerous doubts and psychological strife in Mazzini), he organized another uprising for the following year. A group of Italian exiles were to enter Piedmont from Switzerland and spread the revolution there, while Giuseppe Garibaldi, who had recently joined the Giovine Italia, was to do the same from Genoa. However, the Piedmontese troops easily crushed the new attempt. In the Spring of 1834, while at Bern, Mazzini and a dozen refugees from Italy, Poland and Germany founded a new association with the grandiose name of Young Europe. 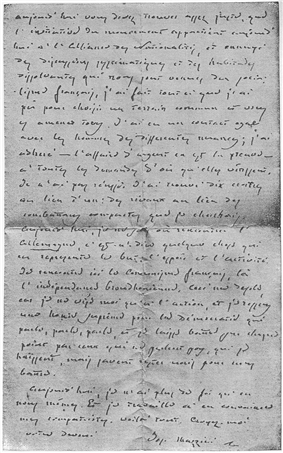 Its basic, and equally grandiose idea, was that, as the French Revolution of 1789 had enlarged the concept of individual liberty, another revolution would now be needed for national liberty; and his vision went further because he hoped that in the no doubt distant future free nations might combine to form a loosely federal Europe with some kind of federal assembly to regulate their common interests. [...] His intention was nothing less than to overturn the European settlement agreed in 1815 by the Congress of Vienna, which had reestablished an oppressive hegemony of a few great powers and blocked the emergence of smaller nations. [...] Mazzini hoped, but without much confidence, that his vision of a league or society of independent nations would be realized in his own lifetime. In practice Young Europe lacked the money and popular support for more than a short-term existence. Nevertheless he always remained faithful to the ideal of a united continent for which the creation of individual nations would be an indispensable preliminary. 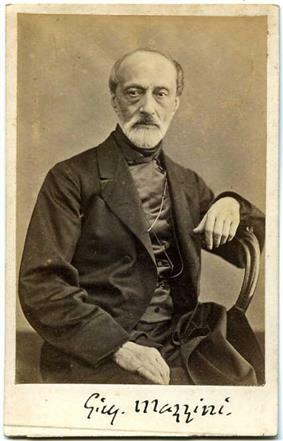 On May 28, 1834 Mazzini was arrested at Solothurn, and exiled from Switzerland. He moved to Paris, where he was again imprisoned on July 5. He was released only after promising he would move to England. Mazzini, together with a few Italian friends, moved in January 1837 to live in London in very poor economic conditions. He resided at a property on North Gower Street near Euston Square, which is now marked with an English Heritage blue plaque. On April 30, 1840 Mazzini reformed the Giovine Italia in London, and on November 10 of the same year he began issuing the Apostolato popolare ("Apostleship of the People"). A succession of failed attempts at promoting further uprising in Sicily, Abruzzi, Tuscany and  Young Germany, Young Poland, Young Switzerland, which were under the aegis of Young Europe (Giovine Europa). He also created an Italian school for poor people active from November 10, 1841 at 5, Greville Street, London. From London he also wrote an endless series of letters to his agents in Europe and South America, and made friends with Thomas and Jane Welsh Carlyle. The "Young Europe" movement also inspired a group of young Turkish army cadets and students who, later in history, named themselves the "Young Turks". In 1847 he moved again to London, where he wrote a long "open letter" to Pope Pius IX, whose apparently liberal reforms had gained him a momentary status as possible paladin of the unification of Italy. The Pope, however, did not reply. He also founded the People's International League. 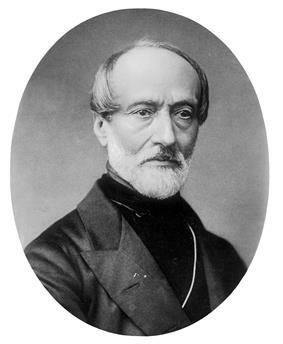 By March 8, 1848 Mazzini was in Paris, where he launched a new political association, the Associazione Nazionale Italiana. On April 7, 1848 Mazzini reached Milan, whose population had rebelled against the Austrian garrison and established a provisional government. The First Italian War of Independence, started by the Piedmontese king Charles Albert to exploit the favourable circumstances in Milan, turned into a total failure. Mazzini, who had never been popular in the city because he wanted Lombardy to become a republic instead of joining Piedmont, abandoned Milan. He joined Garibaldi's irregular force at Bergamo, moving to Switzerland with him. On February 9, 1849 a republic was declared in Rome, with Pius IX already having been forced to flee to Gaeta the preceding November. On the same day the Republic was declared, Mazzini reached the city. He was appointed, together with Carlo Armellini and Aurelio Saffi, as a member of the "triumvirate" of the new republic on March 29, becoming soon the true leader of the government and showing good administrative capabilities in social reforms. However, when the French troops called by the Pope made clear that the resistance of the Republican troops, led by Garibaldi, was in vain, on July 12, 1849, Mazzini set out for Marseille, from where he moved again to Switzerland. Mazzini spent all of 1850 hiding from the Swiss police. In July he founded the association Amici di Italia (Friends of Italy) in London, to attract consensus towards the Italian liberation cause. Two failed riots in Crimean War. Also in vain was the expedition of Felice Orsini in Carrara of 1853–54. In 1856 he returned to Genoa to organize a series of uprisings: the only serious attempt was that of Victor Emmanuel II and his skilled prime minister, Camillo Benso, Conte di Cavour. The latter defined him as "Chief of the assassins". In 1858 he founded another journal in London, Pensiero e azione ("Thought and Action"). Also there, on February 21, 1859, together with 151 republicans he signed a manifesto against the alliance between Piedmont and the Emperor of France which resulted in the Giorgio Pallavicino to move away. In 1862 he again joined Garibaldi during his failed attempt to free Rome. In 1866 Venetia was ceded by France, who had obtained it from Austria at the end of the Austro-Prussian War, to the new Kingdom of Italy, which had been created in 1861 under the Savoy monarchy. At this time Mazzini was frequently in polemics with the course followed by the unification of his country, and in 1867 he refused a seat in the Italian Chamber of Deputies. 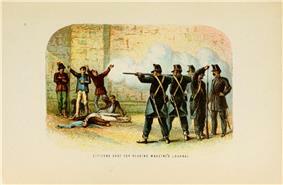 In 1870, during an attempt to free Sicily, he was arrested and imprisoned in Gaeta. He was freed in October due to the amnesty conceded after the successful capture of Rome, and returned to London in mid-December. 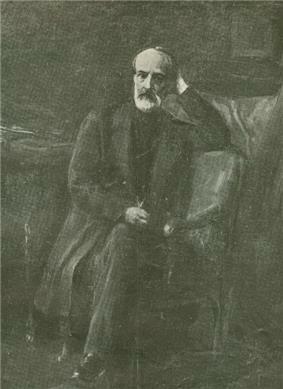 Giuseppe Mazzini died of pleurisy in Pisa in 1872. His body was embalmed by Paolo Gorini. His funeral was held in Genoa, with 100,000 people taking part in it. Bronze bust of Mazzini at Public Gardens John Paul II, in Cremona. Mazzini was an early advocate of a "United States of Europe" about a century before the European Union began to take shape. For him, European unification was a logical continuation of Italian unification. Vinayak Damodar Savarkar was a leader in the Indian independence movement who was influenced by Giuseppe Garibaldi and Giuseppe Mazzini. While the book 10,000 Famous Freemasons by William R. Denslow lists Mazzini as a Mason, and even a Past Grand Master of the Grand Orient of Italy, articles on the Grand Orient of Italy's own website question whether he was ever a Mason and do not list him as a Past Grand Master. Often viewed in the Italy of the time as a god-like figure, Mazzini was nonetheless denounced by many of his compatriots as a traitor. Contemporary historians tended to believe that he ceased to contribute anything productive or useful after 1849, but modern ones take a more favorable opinion of him. The 1973–1974 academic year at the College of Europe was named in his honour. Mack Smith, Denis (1996). Mazzini. Yale University Press. ^ Hunt, Lynn, Thomas R. Martin, and Barbara H. Rosenwein. The Making of the West, Volume C Since 1740 : Peoples and Cultures. Boston: Bedford/Saint Martin's, 2008. ^ Though an adherent of the group, Mazzini was not Christian. ^ "Giuseppe Mazzini - London Remembers". londonremembers.com. Retrieved 4 May 2013. ^ By the Home Secretary, Sir James Graham, 2nd Baronet. ^ Directly in the person of the Foreign Secretary, George Hamilton-Gordon, 4th Earl of Aberdeen. ^ In the person of Baron Philipp von Neumann. ^ Which, apparently, was to follow a plan previously devised by Mazzini himself. ^ Pearce R, Stiles A: The Unification of Italy, Third Edition, Hodder Murray, 2006. Gregory Claeys, "Mazzini, Kossuth, and British Radicalism, 1848-1854," Journal of British Studies, vol. 28, o. 3 (July 1989), pp. 225–261. In JSTOR. Dal Lago, Enrico. William Lloyd Garrison and Giuseppe Mazzini: Abolition, Democracy, and Radical Reform. Baton Rouge, LA: Louisiana State University Press, 2013.